Collingwood is situated on Nottawasaga Bay at the southern point of Georgian Bay. Collingwood offers a combination of old time charm and history with recreation opportunities for skiing on Blue Mountain, and golfing. Collingwood was incorporated as a town in 1858, nine years before Confederation and was named after Admiral Lord Cuthbert Collingwood, Lord Nelson’s second in command at the Battle of Trafalgar, who assumed command of the British fleet after Nelson’s death. The land in the area was originally inhabited by the Iroquoian Petun nation, which built a string of villages in the vicinity of the nearby Niagara Escarpment. 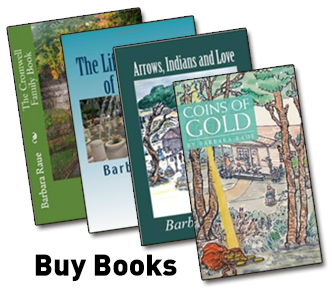 They were driven from the region by the Iroquois in 1650. European settlers and freed black slaves arrived in the area in the 1840s, bringing with them their religion and culture. In 1855, the Ontario, Simcoe & Huron (later called The Northern) railway came into Collingwood, and the harbor became the place for shipment of goods destined for the upper Great Lakes ports of Chicago and Port Arthur-Ft. William (now Thunder Bay). Shipping produced a need for ship repairs, so it was not long before an organized ship building business was created. On May 24, 1883, the Collingwood Shipyards, formerly known as Collingwood Dry Dock Shipbuilding and Foundry Company Limited, opened with a special ceremony. On September 12, 1901, the Huronic was launched in Collingwood, the first steel-hulled ship launched in Canada. The shipyards produced Lakers and during World War II contributed to the production of Corvettes for the Royal Canadian Navy. Shipbuilding was one of the principal industries in the town, employing as much as 10% of the total labor force. Overseas competition and overcapacity in shipbuilding in Canada led to the demise of shipbuilding in Collingwood in September 1986. 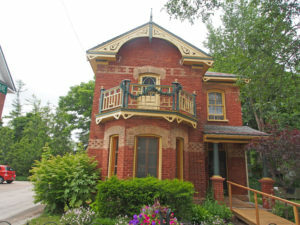 200 Oak Street – This 10,380 square foot Victorian home, the largest and tallest in Collingwood, at the corner of Oak and Third Streets was originally owned by Frank F. Telfer, a leading businessman and ex-mayor of Collingwood. He purchased the property in 1891, and by 1893 the local firm Bryan Brothers Manufacturing Company completed the construction of the Telfer home. In 1925 the Telfer family sold the house, and the “Gowans Home for Missionaries’ Children” was established by the Interior Sudan Mission. This home displays a variety of architectural features. The three storey structure is of double brick construction laid in a stretcher bond fashion and rests on a cut stone foundation. The three main exterior walls are accented by a repeating Greek style pattern running the full width of the walls below the eaves. The northeast corner of the building is formed by a large round turret with a conical roof. There are eighty windows of various shapes set above limestone sills; they include round, oriel, semicircular, and oval as well as stained glass. 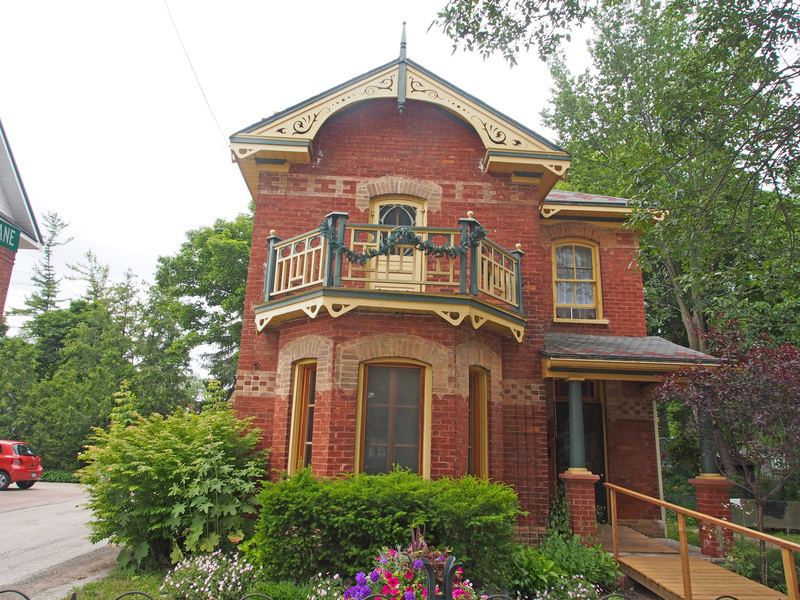 242 Third Street – This 2½ storey brick home was built for Charles Pitt, owner of the Bertram Lumber Company. John Wilson was the local Collingwood architect. The house was built in 1908 and is a Georgian influenced Neo-Classical home. A large pediment and column portico adorns the front façade. A balcony protrudes from the second floor within the pediment which has an elliptical window. Brick alternating radiating voussoirs adorn the window and door surround heads on the façade. 199 Third Street – Built in the Italianate tradition for the Toner family, early coal and lumber merchants, this home has retained its elegance with minor alterations since 1882. The interior of the home features a circular staircase, marble fireplaces, plaster medallions and a built in buffet. The exterior brick work laid in the common bond tradition is highlighted by protruding quoins and plinth in lighter contrasting brick. Decorative brick work adorns the original chimney as well as highlighting the window openings. Brick arch work and keystones decorate the window surrounds in a unique three-tiered stepped arch design. The main front façade contains unique, French doors with recessed mullion and molded panels. The home has a heavily bracketed low hip roof with an east side gable featuring a combination of corniced boxed brackets.